It's shortly before 3 p.m., LeVar Barrino's favorite time of day. 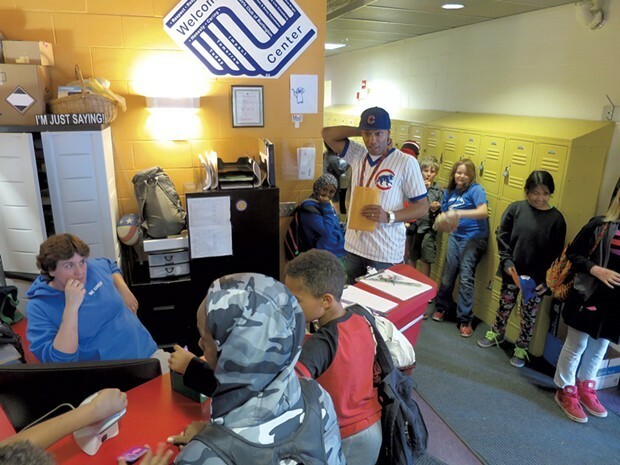 School has just let out, and he stands in the lobby of the Boys & Girls Club of Burlington greeting each kid by name before they run off to their favorite after-school activities: ping-pong, the teen music studio, the cyber café, the basketball court. "Sebastian, how are you doing? Kingston, nice to see you!" Barrino says in his firm but friendly voice, high-fiving each kid as they enter the building. It's easy to see he's a natural at his job. At 6-foot-2, with diamond stud earrings, a USA ball cap, jeans and Nikes, Barrino is a veritable kid magnet — energetic, playful and fun to be around. "No matter what they're going through at school or in their home life, it's like a switch as soon as they see me," Barrino explains. "They're so positive, and that just makes me feel amazing." Throughout his 15-year career at the Boys & Girls Club, Barrino has worn many hats: lifeguard, health and life skills program coordinator, middle school camp director, and head of the afterschool program at the Integrated Arts Academy (IAA) at H.O. Wheeler, a Burlington magnet school. Today, Barrino, 40, is director of individual support services — a fancy moniker, he says, for a job that basically entails working one-on-one with kids after school and during the school day "just to make sure they're in a happy place." To that end, Barrino runs a "lunch bunch," or discussion group for IAA students who are struggling with family problems, self-esteem issues, anxiety, stress or a lack of belonging. Each day during lunch, he sits down with a group of six to eight students for 20 minutes of discussion. "The one rule," he says, "is that the conversation has to be positive and has to be about something they look forward to doing." Keeping students upbeat these days isn't always easy. When Barrino started at the Boys & Girls Club, the job was mostly about providing after-school care and keeping children safe. Today, those responsibilities are just the tip of the iceberg. Most of his students come from the Old North End and Winooski, the most racially and ethnically diverse areas in Vermont. Many live in low-income households that struggle with poverty, food insecurity and homelessness. Some kids have seen parents, older siblings or other relatives taken away to jail or overdose on drugs. As he puts it, "These are the discussions we're having today that I didn't have 15 years ago." Additionally, Barrino works with many New American families who are experiencing the heightened anxieties wrought by America's current political climate. "For our families who are immigrants, it's tough!" Barrino says. "These kids wake up every morning thinking they're going to get pulled out of school or pulled from the Boys & Girls Club and sent away from their families. How do we deal with that? I don't have an answer for that. All I can do is reassure them that when they're here with us, they're safe." But Barrino doesn't let negativity bring him, or his kids, down. One of his primary goals is to instill in them the belief that they control their own destinies. And he shows them how by emphasizing the importance of academics, physical fitness and "making good choices." And he leads by example. Beside the club's front desk are a bulletin board and glass case that display trophies, photos and newspaper stories featuring achievements by local youths, many of them students of color: track meet victories, statewide soccer championships, essay contest winners. One photo depicts a group of teenage girls in hijabs talking to Montpelier lawmakers about a recent immigration bill. Similarly, the walls of the club are plastered with inspirational messages: "Try, try again," "Dream, then do" and "You are beautiful." Barrino himself seems to be the living embodiment of one such affirmation: "You always have a choice." One reason Barrino relates so well to his students and their families is that he knows firsthand what their lives are like. Barrino's father worked as a janitor in a New York City public school. After the law firm where his mother did clerical work went bankrupt, she started her own daycare program. Making ends meet, he remembers, was a constant struggle. Barrino's break came was he was 6 years old. A neighbor told him about the Harriman Clubhouse of the Boys' Club of New York, one of several all-boys' clubs founded in the 1800s to get inner-city boys off the streets and into safer and more productive activities. Though it's unaffiliated with the Boys & Girls Club of America, its mission is similar. "The Boys & Girls Club saved my life and showed me a different path," explains Barrino, who says he grew up in a "rough" neighborhood in New York City's Lower East Side. "It surrounded me with positive kids and mentors to really find my way out." When Barrino was a child, club membership was only 75 cents. "Luckily, I had a dollar in my pocket," he says. That 75 cents opened up "endless possibilities." The Boys' Club provided him with a safe haven, healthy meals and his first job. As a teen, he worked at the Boys' Club's Camp Cromwell, in Martinsville, N.J., first as a bus supervisor, then later as a coach and ropes course specialist. "I realized that was my calling," he says. "Being around kids [and] creating activities was something I was really passionate about." The Boys' Club also provided Barrino with avenues for academic advancement. The club administered an exam that later earned him a full scholarship to Chapel Hill-Chauncey Hall, an elite, three-year private boarding school in Waltham, Mass. As the school's only black male boarding student, Barrino became an easy target of racism, both from opposing sports teams and from some of his own classmates. "People were more curious about my skin color and my hair texture," he recalls. "That grew me up swiftly." But with help from mentors, teachers and coaches, Barrino graduated with a 3.6 GPA and as an MVP athlete in soccer, basketball and baseball. After high school, a coach at New England College offered him "an opportunity of a lifetime" — to play basketball, baseball and soccer at the collegiate level. But two years into it, Barrino realized he wasn't destined to be a professional athlete. "I knew I wanted to be a professional at life," he says. So Barrino pursued a bachelor's degree in kinesiology, the study of body movement. While in college, he met his future wife, Kelly, who grew up in Charlotte, Vt. The couple moved back to Vermont 15 years ago. The Barrinos, who now live in South Burlington, have three kids: Avery, a high school junior; eighth grader Tavian; and fifth grader Isabella. For Barrino, being a homeowner by the time he was 30 was a big deal, especially after growing up in an apartment in New York City. When Barrino isn't working at the Boys & Girls Club, he's coaching his own kids' athletic events or playing on an adult slow-pitch softball team. On weekends, he coaches Athletic Amateur Union (AAU) basketball, a traveling team for elite Vermont athletes. Suffice it to say, talking to kids about "being model citizens and making good choices" has never been a 9-to-5 job for him. But instead of constantly barking "No!" and "Don't!" to the kids, Barrino is all about reframing negative situations in a positive light. At the Boys & Girls Club, rather than "No running in the halls!" he'll ask, "Can you show me what walking looks like?" At one point, he eavesdrops on three middle-school girls, one of whom announces to her friends that she intends to drop out of school after eighth grade. "Why?" Barrino interjects. Because her mom did, she explains. Rather than chide her, he asks calmly, "How much more can you do if you graduate instead?" The result of such gentle prodding is that the kids see him less as an authority figure and more as someone in whom they can confide. "LeVar is a very good person. 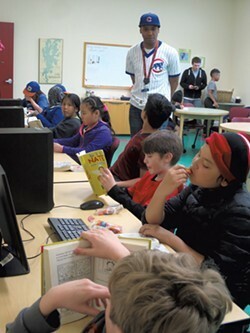 I like him a lot," says Maxime, a seventh grader at Edmunds Middle School. "He tries to be friends with the kids and do his job at the same time." "I think he's a great organizer. And he's very respectful of other people's wishes and desires," adds Omari, who's 12. "Some of the other staff here ... don't understand ... what's cool." When 9-year-old Nylah, an African American girl with beads in her braids, is asked why she likes hanging around with Barrino, she announces proudly, "LeVar is my uncle." "She's not really my niece," Barrino clarifies, after the girl walks away. "I'm everybody's uncle here." Or mentor. Dominic "Dom" Chatot is a 23-year-old senior at the University of Vermont who interns at the Boys & Girls Club three days a week. Born in Ethiopia, Chatot was adopted at age 5 and raised in Thetford. "LeVar and I immediately connected because we're both very outgoing people," says Chatot. "It's nice to see someone who has such passion and drive to see these kids succeed." Indeed, Barrino has now been at his job long enough to see former students do just that: graduate and get jobs in the community. Tanasia McGee was 11 years old when she moved to Burlington from the Bronx. A couple of years later, she met Barrino, who was coaching her local basketball team. "He was just a cool guy, so I loved coming to the club," McGee recalls. "He was one of the people who really helped me out because he came from the same place I came from." When McGee turned 16, Barrino offered her a volunteer position, then a paid job, working at IAA. Today, McGee is 25 and working at IAA as a paraeducator. One clue as to how well-regarded Barrino is in the Old North End: Last summer, Burlington artist Maggie Standley was invited to paint murals on the side of the Burlington Parks & Recreation building in Roosevelt Park. Barrino was surprised to show up for work one day to see his own face on the side of the building. Leave it to Barrino to use it as a tool for positive change. During summers, he does park patrol, looking for kids who are, in his words, "not making good choices" — smoking, fighting, drinking or using profanities. 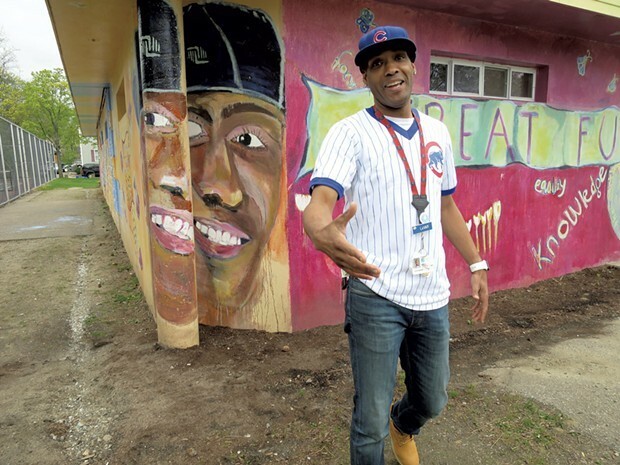 Barrino will point to the mural and remind them, "No matter where you move, my eyes are always on you!" This article was originally published in Seven Days' monthly parenting magazine, Kids VT.